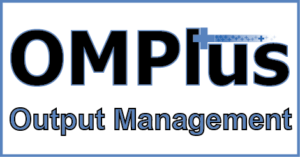 The Plus Technologies output management and print management software product portfolio is called the OM Plus Suite. OM Plus print management software consists of multiple print management software products each designed to solve a specific kind of output management problem. Products in the OM Plus print management software Suite can stand on its own. However, our print management software products can be combined into print solutions to suit specific customer print output needs. This ability to integrate the print software solutions together provides a wide range of capabilities and scalability. Moreover, this integration can be quite helpful to solve unique document related business problems. Plus Technologies is very experienced in solving print output or document flow related business problems with our print management software. We have sold tens of thousands of print software systems to a wide variety of customers to solve a huge range of print related problems. Our Services team listens carefully to our customers to fully understand their output management related requirements. We work collaboratively with the customer to design the right print solution for each customer situation. In most cases, we assist in customer testing to prove the solution works as it should (before asking the customer to purchase). Furthermore, Plus Technologies will customize solutions for individual needs. We will be involved in implementations as well as training. We will train users how to get the most out of their solution.